Welcome to the Women of West Islip Organization. This organization consists of the wonderful, hard-working, loving women of West Islip. We were founded in November, 2010 by Regina Jacoby and Patty Vorilas. The objective of this group is to work together to make West Islip the great community that it should be. We will work together to help the organizations within our community, provide philanthropic services and outreach to families in need in West Islip and through working together and make strong bonds with each other. We feel that our organization will one day be one of West Islip's finest. We do not require that you belong to any particular affiliation or possess any previous memberships to join our organization. We do ask that you support our organization. Women's History Award of Distinction! Congratulations to WOWI for receiving the 2017 Women's History Award of Distinction! 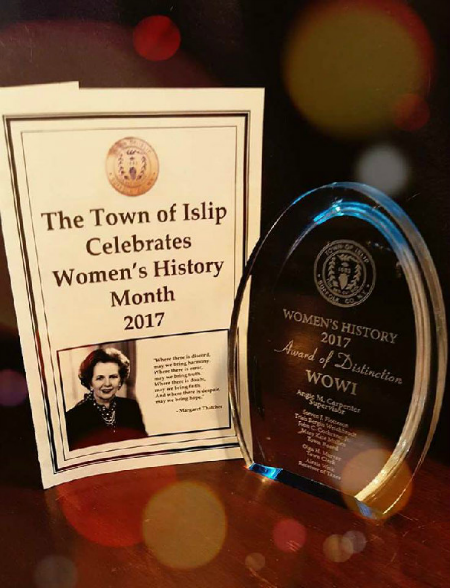 Islip Town Supervisor Angie Carpenter and the members of the Islip Town Board recently participated in the Town’s annual Women’s History Awards ceremony. March is national Women’s History Month, and each year the Town uses the occasion to honor women in the community who have made an impact in the lives of others. the leadership of the organization. To receive text messages about updates on meetings and events, text, @4deca89 to 81010 (number). You do not have to download an app. Copyright © 2019 Women of West Islip. All Rights Reserved.